Help, My Dog is Growling! "Help, my dog is growling!" Think of growling as a good thing. It's a way a dog warns that he is uncomfortable with a situation. It's his lowest level way of saying that whatever is going on makes him uncomfortable. Many people mistakenly think growling is bad, so they punish the dog for it. They make the dog stop growling, but do nothing to address the reason WHY he growls. So then, if the dog is in another situation in which he feels uncomfortable, he may snap without growling, since he's been punished for growling in the past. Then he is accused of "biting with no warning." It's not really his fault, as he's been repeatedly corrected for growling. Instead, an owner should address the reason WHY the dog growls. Take steps to make him feel more comfortable with the situation, so he has no reason to growl. Depending on what is going on, a good way to help the dog is to use treats to help him build a positive association. If he growls at another dog coming to close, before the dog gets too close, start offering him treats to keep his attention on you and not growl. Don't wait until he growls and then treat, or you reward that and he'll continue to growl at the approach of another dog. The idea is to keep the other dog at enough of a distance that your dog doesn't feel threatened, and gradually decrease the distance between the two without causing your dog to feel the need to growl, and while still feeding treats. It can take several or more sessions, but if done correctly you can help your dog feel comfortable. The same process can be done with anything, human or animal, that makes him growl. If he growls during grooming, use the same concept, feeding treats BEFORE he starts to growl, and doing small parts of the grooming regimen. Gradually increase what you do, while treating him, until he can tolerate the whole thing with no growling or stress. You can apply this concept to any area of your dog's life, until you have a dog that seldom growls as he doesn't feel the need. And, you will have built a great level of trust, since the dog sees you understand his discomfort and work to help him feel safe, rather than punishing him for telling you he's uncomfortable. To help you learn more about canine body language, you may want to read this page and take the photo quiz. You will also want to read the great information on the "Calming Signals" page. Another part of puzzle is making sure you aren't rewarding growling by trying to talk soothingly to your dog. All that does is tell him that you approve of his growling. You are still not addressing WHY he is growling in the first place, but instead of making it go away by correction and setting him up to bite without growling and warning, you will simply increase the growling by rewarding it. A dog is not human and doesn't understand your soothing talk is supposed to make him less afraid, he only knows you are supporting him. The ONLY way to address the situation that really will have long lasting results is by helping him build a positive association with whatever is causing him to growl in the first place. By the way, the dogs in the photo at the top of the page are displaying normal canine behavior. 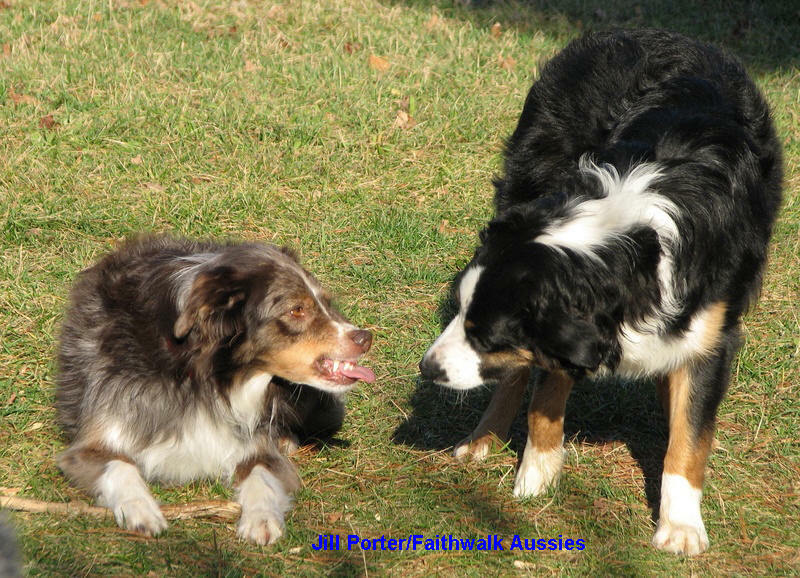 The red merle on the left has a stick he wants to keep, and the black tri on the right is being submissive and hoping he can convince the merle to give him the stick. He did pester the merle a bit before I shot this photo, and the merle gradually used stronger and stronger cues. The merle is not a "mean" dog nor is he being overly aggressive. His facial expression is just clearly communicating that he wants to keep the stick very much. After a bit of trying, the tri respected that and found something else to do. In a balanced group of dogs like the two above, they can display various behaviors without using actual force, so no dogs get hurt. And I would never punish the merle in this situation. If I was worried that the tri may push to the point of getting hurt, I would merely call the tri away. "Be anxious for nothing, but in everything by prayer and supplication with thanksgiving let your requests be made know to God. And the peace of God, which surpasses all comprehension, shall guard your hearts and your minds in Christ Jesus."